Newton, NJ – September 13, 2016 – Thorlabs has expanded its piezoelectric line to include new types of piezoelectric actuators, low-voltage piezoelectric chips, and discrete stacks with through holes, enabling a higher level of flexibility when integrating the actuators into other devices. These chips are ideal for laser tuning, micro-dispensing, and life-science applications. 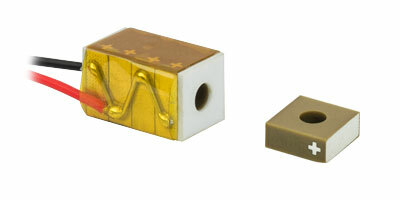 The chips can be manufactured with or without pre-attached wires, with holes ranging from Ø2.0 mm to Ø6.0 mm, cross sections ranging from 5.0 mm × 5.0 mm to 10.0 mm × 10.0 mm, and thicknesses under 5.0 mm. Stacks are available in lengths from 5 mm to 100 mm, providing free stroke displacements up to 100 µm. Our in-house manufacturing facility can also be deployed to provide custom dimensions, voltage ranges, and coatings upon request. Leveraging our high-volume production capacity allows us to fulfill high-volume quantity requests with short lead times. The piezoelectric chips are driven under a maximum voltage of 150 V, providing maximum free stroke displacements from 1.8 µm to 3.0 µm with sub-millisecond response time. Through a precision grinding process, the accuracy of the design height is ensured to better than ±5 µm. The high accuracy makes it significantly easier to design devices around our piezoelectric chips, as it allows the users to have a loose tolerance when choosing their other components, and helps guarantee a better parallelism when employing multiple chips between two substrates. Besides the newly released piezo chips/stacks, Thorlabs manufactures a wide range of high quality piezo actuators, including chips, stacks, tubes, shear piezo and bimorphs. Modular, screw, and replaceable-tip piezo actuators, including single axis, multi-axis, closed-loop and open-loop actuators are also available. For more information on the entire product offering, please see the complete product presentation at www.thorlabs.com/piezo.